Happy Bank Holiday Monday to you all. I hope you're having a great day if you're on holiday. I was until they started knocking down the fence next door lol!!! What a racket. Its a big day today over on the Graphic 45 blog today with the announcement of the new Design Team and Ambassadors. I'm absolutely honoured to have been asked to be one of the three new Ambassadors, It's an invite only one year contract and I join Laura Denison (USA) and Jane Tregenza (Aus) on this new venture. Thank you Charee Diane Amie and the team and everyone who supports me through my blog, You Tube channel and comes along to my workshops and retreats around the country. I'm very touched and honoured too. Here's the link to the G45 blog where you can see all the finalists and their amazing entries along with the totally amazing sneak peeks of the new Halloween Collection - An Eerie Tale, its absolutely gorgeous. Congratulations Clare! on being selected as an ambassador for the G45 DT! Looking forward to see all your new creations! 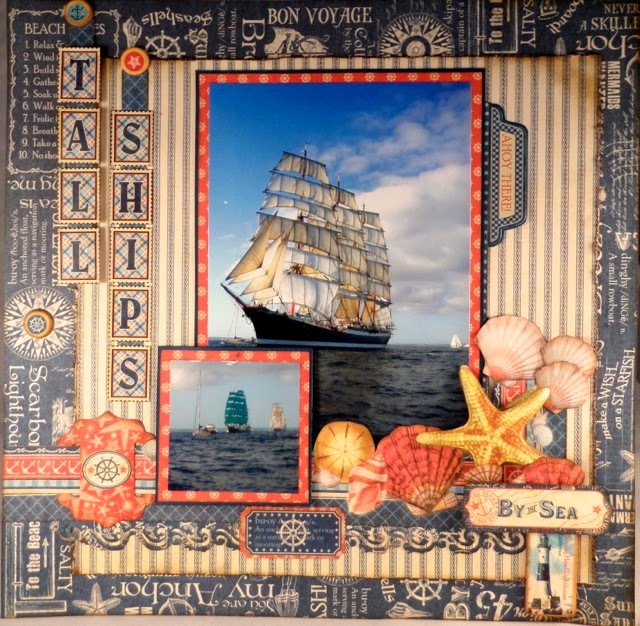 Love the tall ship layout! Congratulations Clare, you deserve the accolade ! congratulations Clare and a gorgeous layout. Morning Clare, I was 'over the moon' when I read that you were going to be an Ambassador for Graphic 45, I was getting really worried as I hadn't seen your name in the running for the DT, but I am happy again now, well done !! I'm loving your layout, really beautiful. I am absolutely adoring the Eerie Tale sneaky peek, it looks absolutely divine, it really 'sings' to me. I hope the 'racket' has now stopped next door, we have a problem with the bloke whose garden backs onto ours at the back, not only has he planted trees all along our fence, that are so tall it is unbelievable and we get no sun at all in our garden in the afternoon !! but he also thinks that everyone in the neighbourhood wants to listen to 'his' music, he has it so loud with his french doors wide open so he can listen in his garden, but unfortunately we all have to listen too !! so annoying haha. Congrats Clare, a well deserved honor Ambassador for Graphic 45. Love your work and your on line video. I'm haven so much fun making the mini albums. Such a sweet, kind and helpful person you are. I am not sure what you will be doing in your new role, but I look forward to finding out. There are many people out there that make things with G45 papers, and the papers are indeed gorgeous, but you always make even G45 papers shine brighter! Thank you Clare for choosing to share your talents with us, and once again, congratulations! Helloooo there, many thanks for your lovely message. Hope alls well with you on the other side of the pond. Congrats, Claire! I'm so glad you're back with Graphic 45 and can't wait for all of the new projects you do. Congratulations Claire and well deserved too!